What if drinking water could be drawn from desert air easily, without requiring enormous amounts of electricity from a grid? What if a doctor could do a biopsy for a suspected cancer without a blade of any sort? What if we didn't have to wait too long for the result? Technologies that make these visions a reality are expected to become increasingly commonplace in the next few years. 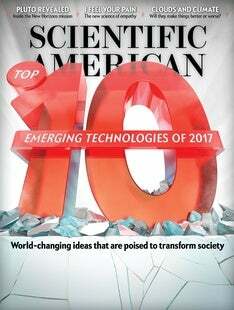 This special report, compiled and produced in a collaboration between Scientific American and the World Economic Forum's Expert Network, highlights 10 such emerging technologies.